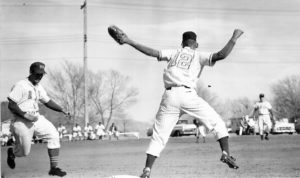 Melvin Harter of Witten was a member of the 1960 baseball team at Black Hills State University. This year that team will be inducted into the Yellow Jack Hall of Fame during BHSU homecoming Sept. 28-29. The team will be recognized during a banquet on Sept 28 and they will ride in the Swarm Day parade in Spearfish on Sept. 29 and that afternoon will be recognized at the football game. The 1960 baseball team won 13 games and lost four and was invited to the NAIA national tournament. Harter believes the 1960 team in the only baseball team that played in a national tournament. The national tournament was in Omaha and BHSU lost the first game. Also playing on that team were Dennis Harter, Witten, a cousin of Melvin; Rocky Jones who was from Winner at that time and Bob Johnson of Gregory. The baseball team at that time boosted one of the best pitching staffs in the Midwest led by Mike West, Jim Lawton, Dan Badger, Duane Baer and Neil Doeden. Melvin Harter was a catcher on the team and when Doeden pitched he only wanted Melvin as the catcher. West and Doeden went on to play in the Basin League. Winner was one of the towns fortunate to have a Basin League team. The BSHU team was coached by Cliff Papik. Harter says he is looking forward to the reunion and induction into the college hall of fame. “I don’t know where a lot of them are and it will be nice to see them,” he said. Harter graduated from BHSU with a degree in math and a minor in physical education. After graduating from college he taught one year in Gregory from 1961-1962. In 1963, he went to California and worked for Pacific Gas and Electric. It was in California that he met his wife, Wilma. In 1967, Harter started work with the engineer division of the South Dakota Department of Transportation in Kadoka where worked for four years. In 1971, the family moved to Garland, Texas, where he worked with his uncle, Lester Aeschbacher in TV repair. Then, Harter moved back to Winner and worked at Custom TV with Ray Totton. While working in Winner, Harter also helped his father on the farm in Witten. Eventually, Harter took over the farm. He has been on the farm for 51 years. Baseball has been a big part of Harter’s life. Harter played on the Witten amateur baseball team that went to state in 1960 in Watertown. For Witten, Harter played third base. The Harters have three children, 8 grandchildren and 10 great grandchildren.